This guest post is from senior Samantha Smart, who received an Arts Innovation Grant to bring more Hopkins students into contact with one of Baltimore’s most intriguing historical figures, Edgar Allan Poe. Every September, football fans put on their purple jerseys and migrate to M&T Bank Stadium for the National Football League’s Opening Day. Every October, a mysterious figure dressed in black pays a visit to Westminster Burying Ground for an annual midnight toast. Every year, over a thousand people from all over the world make their way to a small house at 203 North Amity Street. The Home of Poe and Mrs. Clemm. Courtesy of the Enoch Pratt Library. Via the Edgar Allan Poe Society of Baltimore. 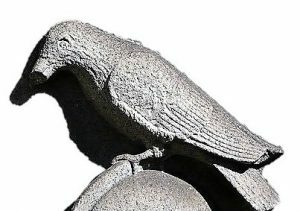 Nearly 170 years after his death, the spirit of Edgar Allan Poe still dwells in Baltimore. His famous poem, “The Raven,” lives on in the name of our football team, his grave is the site of the Poe Toaster’s homage on the anniversary of his death, and the house where he spent some of the few peaceful years of his turbulent life attracts his many fans. What is it about Poe that makes him so popular today? And why is Baltimore so integral to his legacy? These are the questions we will explore in this special tour of Edgar Allan Poe’s Baltimore, a one-time, free event this coming Saturday, April 14, from 1 pm to 6:30 pm. During the tour, limited to just twenty Hopkins students, you will have the opportunity to visit and learn about a variety of Poe-related sites—and contribute to our local Poe lore through your own photographic documentation of these sites, which will become part of a digital exhibition. We will begin by visiting the Edgar Allan Poe House and Museum—where Poe lived as a young poet just starting out. From there, we will stop by Westminster Burying Ground—Poe’s final Baltimore residence. We will peek inside the stadium that is home to the only major league team in America named after a work of literature. And we’ll end the afternoon at the beloved Annabel Lee—not the poem, but the classic Baltimore tavern, where we’ll share a meal. Along the way, you’ll learn about Poe’s life and work, and commemorate your experience of Poe’s Baltimore through photographs. And just to reiterate, all tour attendees will receive FREE transportation, admission, tour guides, and dinner, thanks to the support of an Arts Innovation Grant! No prior knowledge of Poe is required! The tour is meant to be a fun learning experience and a one-of-a-kind opportunity to explore Baltimore. To register, follow this link. We only have room for twenty students, so reserve your spot soon! This is a terrific public history project. Well done!